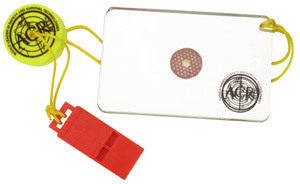 Signaling devices can save a divers life! You Have to Be SEEN to be Rescued! Safety signaling devices are critical! The open Atlantic is not the best time to start to figure out just how you are going to attract the attention of the dive boat that is now 1/2 mile away. You must think about this possibility before you get separated from the boat in the open ocean and just how you can survive the ordeal - and you can. Divers spend thousands of dollars on dive equipment, camera gear and other toys, but often nothing on some simple primary equipment that just might save your life. There are many very easy to carry items that truly can save your life by making it possible for the dive boat, Coast Guard or other searchers to spot you in the water. After all, finding you is the real problem, picking you up once you are seen is the easy part. Think for a moment about the target a diver floating in the water presents. Even with your BCD fully inflated, generally just your head and maybe your shoulders are poking out of the water. Your head is about the size of a coconut and that isn't very much to see from any distance. Now add some wave action and a few whitecaps into the picture and it becomes almost impossible to spot your head as it bobs up and down in the ocean. To add to the problem, most dive gear isn't very bright, with the blues and blacks that are so popular blending right in with the sea. Unless you are going to be assaulting the beach with the SEAL team think about adding some bright colors to your gear. What follows is by no means a complete list of what might work and there may be additional things you can carry that might improve your chances. The mere possession of any of this equipment is no guarantee that you will be rescued, but preplanning and carrying some signaling devices goes a long way to making your rescue even possible. Part of the requirement for diving from our boat is that the divers have some safety signaling devices with them; a whistle and "safety sausage". This is the absolute bare minimum that a diver should carry on any ocean dive as you must be able to make an audible signal and improve you chances of being seen. We keep extras on board and hand them out all the time to divers that are not prepared. Audible Device - you must have at least the whistle, preferably both the whistle and the air horn. Standard plastic whistle - It's only as loud as you can blow, but it always makes noise. Some can be heard up to 1/4 mile or so in good conditions. The Dive Alert attaches to the BCD hose and uses tank air pressure to make an ear splitting shriek that is heard for some distance. But if you are out of air, nothing - so you still need the cheap plastic whistle. The Dive Alert is the best audible device available and we believe in them enough to use them on all our loaner gear. The Dive Alert can also inflate your SMB if you hold the valve of the SMB tight against the horn and push the button. Ask me and I will demonstrate this little known feature. There are many devices that can help you out, some are very low tech - but work, others are high tech and work great but rely on batteries. One of the best visuals you can have is the "Safety Sausage" or often called a Surface Maker Buoy or SMB (Also called "Tubes" "See Me Buoys" Etc..). Rolled up and clipped to your BCD it just hangs there out of the way. Inflated, it stands up and can be spotted a long ways off. Don't be cheap. Get one made out of heavy material with good snaps etc. There are dozens of SMB's on the market now so pick a good one. The better ones have reflective tape and some even have attachment points for lights. Dive Alert makes one model that has LED lighting inside the sausage so the whole thing lights up! High winds can make them lay over and not stand up straight, but the color is the thing. Try it out before you are in the ocean to make sure you know how it works. Clip it to you before inflating! 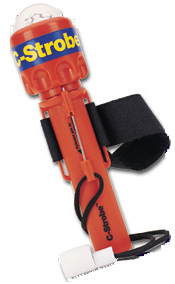 The Rescue Streamer is a very simple device that is a rolled up piece of plastic that is high visibility orange. 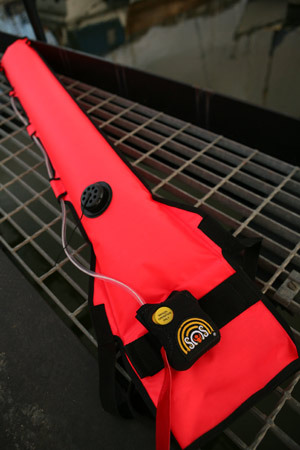 it simply floats on the water attached to the diver and helps the searchers locate you. It improves the chance you will be seen from the bridge of the boat or from the flight deck of the Coast Guard Helicopter. Attach it to you before deploying! There are divers that carry small hand launched flares in their BCD pocket for emergency signaling on the surface. They work best at night and most are not guaranteed water proof to diving depths but some do survive a season of diving. 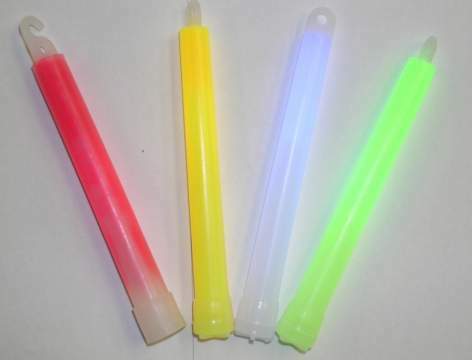 Cheap and easy to use, once it gets dark even the glow from a light stick will make you stand out like the Fourth of July as it is really, really, dark at night on the sea. The down side is they are sometimes already activated when you rip them out of the package so don't count on them as a primary device. 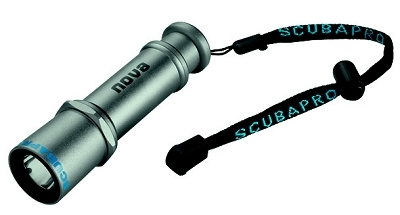 Carry a small flashlight with you on every ocean dive. The new LED ones are extremely tiny but have a good strong beam and long battery life. Nothing like a flashlight beam pointed at the searching boat or aircraft that says, "Hey Guys! I'm over here!" I carry two lights on almost every dive...Think about it. On a dark and stormy night, there is nothing like the flash of a Xenon Strobe. Get one that is small, waterproof and relatively inexpensive. But you must maintain the batteries. Available at most Dive shops and Marine supply stores for not too much $, but make sure its depth rated. A lift bag can be used to attract the attention you need. One helped me get located many years ago, in the time way before someone thought up the SMB. You have to attach it to you somehow or it will go away and open bottom bags may need attention at the surface to stay inflated. 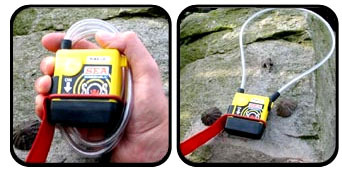 The ultimate solution for the lost diver consists of a radio transmitter that is carried with them during the dive and activated as needed on the surface. Now there are two types of radio transmitters, waterproof VHF/GPS units like the Nautilus Lifeline Radio and EPIRB units. The EPRIB units broadcast on 406mhz or 121.5mhz, the international SAR homing frequency, which can be located by the Coast Guard or any boat/aircraft equipped with a Direction Finding receiver. The 406mhz frequency communicates directly with the satellite based Search And Rescue system and should work anywhere on the Globe. 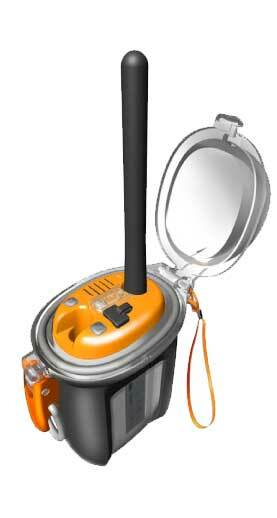 Two companies have produced an 121.5 EPIRB product that is water proof to diving depths, ACR and Sea Marshall. 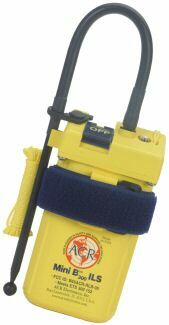 Recently, I have seen a few divers onboard carrying both ACR and McMurdo 406mhz PLB EPIRB units in small waterproof cases. Only a 406mhz unit like these can contact SAR directly thru the satellites. 121.5 signals are local homing freqs only and have limited range. The older PLB units in a pressure case produce not the most compact design as the one case was about 10x4x5 and the diver was carrying it in cordura nylon zip pouch on their BC. Seemed like a good solution, just not ultra compact. The other diver had his in a waterproof tube that was attached to the utility rings on the BCD. He added a little float to the McMurdo PLB to ensure it was buoyant outside of the waterproof tube. Neither solution was elegant, but both effective. If they activate the unit, someone is going to know where they are and come looking. The newest ACR PLB is very small about the size of a pack of cigarettes, so this would be the way to go for a PLB. We need a manufacture to get with it and make a totally waterproof PLB unit that needs no housing. The Sea Marchall beacon is a fairly small unit that is sealed and depth rated to 100mtrs. To deploy it the diver places the antenna around their neck and manually activates the transmitter. It then broadcasts on 121.5 and requires that someone is looking for you as the US Coast Guard has recently stopped monitoring 121.5 continuously, but still uses it for the active search phase of a rescue. The Antenna of the Sea Marshall lights up when it transmits, adding that to the value of the unit. There is a little pouch that can hold the unit during the dive clipped to your BCD. Sea Marshall also have a SMB that gives you a visual signal as well as a way to carry the beacon. It also places the antenna much higher out of the water for increased range. Cost for a diver unit is apx $350 and a receiver for the boat is apx $3500. But being found when lost at sea - priceless. The ACR unit that was designed for divers was similar to this also discontinued "Mini B" unit. It is small enough to be carried in most BCD pockets or strapped on with little effort and is manually activated by the diver. The diver versions are still in use by several live aboard groups operating in remote areas. I have not been able to locate the ACR product and it appears to be discontinued. The standard unit is only waterproof to 10mtrs but are plentiful on ebay but I have not been able to find any of the diver units. Both ACR units transmit on 121.5, and operate on the same homing principles as the Sea Marshall units they just are not as compact nor as cleanly designed and are hard to find and as they age out may not be reliable. The other High Tech solution was new in 2011, the original Nautilus Lifeline Radio and has already been used by many divers to be rescued. This unit was a very compact VHF radio with a built in GPS. With the top case closed the radio is water proof to 425 fsw. At the surface the diver can open the top cover and transmit on VHF channel 16 (Orange button), one other "chat" channel (Green button), or make a distress call using the RED button on the radio. 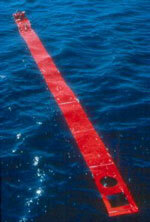 Go to our page about the LIfelines, or Dive Alert's website for complete information. Using current DSC (digital select calling) technology which is in all newer marine VHF radios, any boat within range will receive the calls from this unit and can talk back to the diver. On our boat the position of the DSC call from the Lifeline is even displayed on the GPS navigation screens. On any other properly set up dive boats this should also occur. After looking at these units we bought them for all the crew on our boat. We are a dealer for this radio unit and all the other Dive Alert products. Lifeline chose to redesign the unit to become a smaller and simpler to use package. The new version of the lifeline does not have the two way VHF radio functions and does not require charging. It still has a very accurate GPS and makes the emergency call using the DCS system but the diver cannot talk to the rescuers. The package and price got smaller and the Lifeline no longer needs a desktop interface to field program. Less features, but still the best thing out there. If you are serious about your diving safety, you will own one of these units. The ultimate survival tool that you will have with you is not something you buy in the store, but what you develop as you build your dive experience - the ability to not panic. If you find yourself adrift in the sea, separated from the dive boat, the one thing you must do is control your fear and panic. The same technique that works underwater works on the surface too - Stop, Breath, Think! You must not panic! The equipment you are wearing will keep you alive a long time even in cooler water temperatures. You must maintain a positive attitude and take action to make yourself more visible and stable in the water. Use the equipment you have to your advantage by fully inflating the BCD to ride as high as possible. Drop your weights if need be and this action alone may make a big difference in your ultimate survival. Maintain your airway by using the snorkel and keep the mask on your face. If you take off your mask, in a very short time the saltwater in your eyes will be very irritating and effect your vision, so keep that mask on! Think about the gear you have and deploy what will make you a better target for the searchers to see. Again, the bottom line is you must be seen to be rescued! Please visit this page for procedures on the diving. This is open ocean wreck diving - take an advanced class or a shipwreck/ocean diving class if your skills aren’t quite there yet.